I regret to report that Ted Tsukiyama passed away on February 15, 2019 at home at the age of 98. 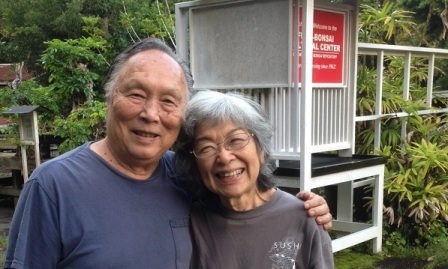 Ted co-founded the Hawaii Bonsai Association and was the secretary-treasurer for the first 10 years and the president for many years after. Under his leadership, Hawaii played a major role to support Japan master Saburo Kato to create the International Bonsai we enjoy today. Kato, Tsukiyama, and John Naka are recognized as the founders of the World Bonsai Friendship Federation. Much more about Ted Tsukiyama will be in future issues of FBnews. Please sign-up of the form below to receive an email notification. www.gofundme.com/save-fukubonsai is live and online with a Phase I goal of $100,000. Fuku-Bonsai sprayed defective Benlate contaminated with weedkillers in 1989 and forced into a 30-year battle for survival. Losses were over $30 million --- not including the cost of having to completely develop all new crops as the residual contamination prevented growing the original Brassaia crop which funded our impressive early years progress. Nor does this include developing all new products and recropping. Total net recovery of the 1994 Benlate product liability and the 2007 DuPont fraud settlements after taxes and legal costs were less than 10% of our losses. We made steady progress with limited funds. With the support of everyone we survived and we thank you! Please go to the campaign for more information and to make a donation. Fuku-Bonsai Cultural Center and the website is co-sponsored by Fuku-Bonsai Inc. (which underwrites all costs, acts like a B-Corporation, and is the primary center host) and the non-profit Mid-Pacific Bonsai Foundation (MPBF). If you want a tax-deductible receipt, at the time of your donation email david.f@fukubonsai with the date, your full name (or organization), and mailing address. Your donation will go to MPBF and they will mail you the receipt. NOTE: The GoFundMe fundraiser began in August 2018 to help generate working capital to complete recovery and start expansion. Two weeks later we were hit by Hurricane Lane flash-flood! MAJOR FLOOD DAMAGE AT FUKU-BONSAI! 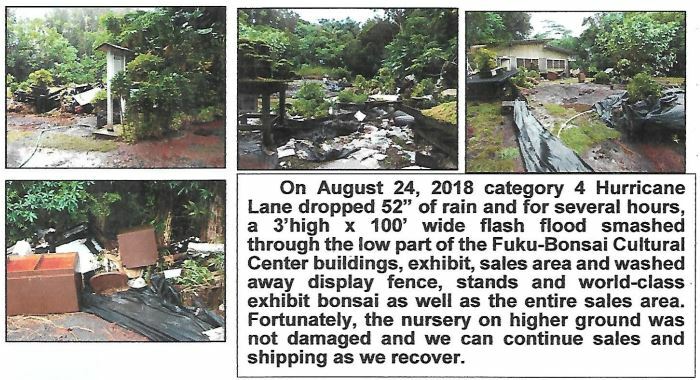 Before Hurricane Lane, the Fuku-Bonsai Cultural Center included an exhibit and educational bonsai collection featuring TRUE INDOOR BONSAI™. 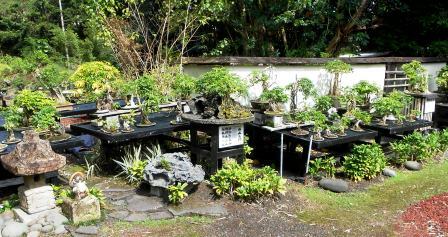 Fuku-Bonsai is the oldest Hawaii certified nursery. We specialize in Dwarf Schefflera which is the ideal gift bonsai and the best high-success plant for growing in homes and offices throughout the year and outdoors when night temperatures are above 55°F. Our Hawaiian Lava Plantings are great for gifts! Premium Potted Bonsai are the highest quality available on the Internet, including Custom Collection over 40 years in training! Our very affordable, popular, younger plants are great values to learn the art and culture of bonsai! There's a large selection of certified plants that can be shipped by FedEx to all parts of the United States with safe arrival guaranteed. We're most proud of our Introductory Workshop Package (IWP) which was introduced in 2007 and taught thousands. The favorite of our repeat customers is the Premium Workshop Package created in 2014. YOU'RE INVITED TO VISIT! (Left photo) David and Myrtle Fukumoto pioneered True Indoor Bonsai since 1962. 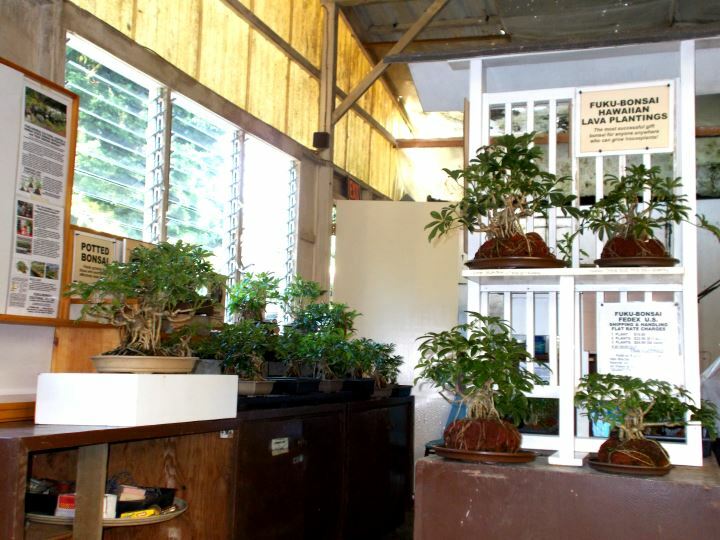 (Right photo) Since Hurricane Lane, a temporary sales display has been set up in the Visitor Center/Office including Dwarf Schefflera Hawaiian Lava Plantings (4 sizes) and Premium Potted Bonsai (4 sizes) to allow center visitors to select specific plants to ship to all parts of the U.S. (weather permitting). We are currently all out of our special safe, extra slow-release fertilizer and/or Introductory Workshop Package ((IWP) and Premium Workshop Package (PIWP). We have suspended giving workshops for now but invite visitors to bring photos of their True Indoor Bonsai, to talk story, and get tips on training or care. THE FUKU-BONSAI WEBSITE IS NOW BEING REBUILT! We are happy to share what we know and want to see Fuku-Bonsai evolve into a public domain company to benefit bonsai, the Big Island visitor industry and the community. Please email comments and recommendations of how to make www.fukubonsai.com the best True Indoor Bonsai™ informational resource and the outstanding Internet source of premium plants. I will continue to respond to emails on a one-on-one basis. We look forward to introducing Hawaiianite™ which is a superior universal fertilizer to be available in the future. To date, Hawaiianite has only been extensively tested for bonsai production and only by Fuku-Bonsai. If you are interested in participating in the initial trials, being a retailer or distributor, or investor, please email me for more information. Your are cordially invited to sign up for either or both of our email newsletters. FBnews will be a monthly and primarily include information for those especially interested in Tropical and True Indoor Bonsai and include specialty Hawaiianite bonsai applications. This replaces the Journal of Tropical and True Indoor Bonsai that was sent to Fuku-Bonsai customers, gift recipients of our products, Fuku-Bonsai Center visitors and others who requested to be on our emailing list. We have no desire to spam or send to those not interested and, therefore, require signing up and providing all information which will go directly to Constant Contact who will manage and remove those who request or those whose emails bounce back. There are no fees, but if you appreciate our efforts, please become a member or make donations to the non-profit Mid-Pacific Bonsai Foundation which co-sponsors the Fuku-Bonsai Cultural Center and the Fuku-Bonsai website including helping to cover the costs of the free educational exhibits and workshop assistance. HAWAIIANITE™ NEWS is a new newsletter will contain information of Hawaiianite applications for major users, retailers, distributors, or agricultural organizations. So far strongest interest have been from orchid/floriculture, container nurseries, medical marijuana, landscapers, and long-term specialty crops. We will assist in creating high-integrity comparative trials and publish the reports. © Fuku-Bonsai Inc and Mid-Pacific Bonsai Foundation. 1999, 2000, 2001, 2002, 2003, 2004, 2005, 2006, 2007, 2008, 2009, 2010, 2011, 2012, 2013, 2014, 2015, 2016, 2017 and 2018. Permission to reproduce a single page or a single photo is permitted for non-commercial usage provided www.fukubonsai.com website credit is given. All other rights reserved. PRIVACY STATEMENT. Fuku-Bonsai collects names, city and state, and e-mail addresses for the Journal of Tropical & True Indoor Bonsai from order forms, the guest book at the Fuku-Bonsai Cultural Center, and as an honor system benefit for the members of the Mid-Pacific Bonsai Foundation. Fuku-Bonsai will not sell, trade, or make public email addresses. To remove, reply with "remove" as a subject. THE FUKU-BONSAI WEBSITE DOES NOT UTILIZE ANY "COOKIES". AND WILL TELL YOUR FRIENDS ABOUT OUR SITE! *** Go to www.gofundme.com/save-fukubonsai for more information or to make a donation.